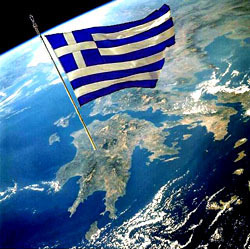 Greece cannot pay its debts. Period. It has no choice but to default. Once it defaults, it will be unable to borrow and it will be forced to cut spending even more than it has already. This will damage its economy further, which in turn will reduce tax revenues, which will require further spending cuts, which will damage its economy further, et cetera without end. This is obviously unacceptable. The only answer for Greece would be to exit the euro and devalue its currency. As painful as this would be, it would almost certainly be regarded as preferable to years or decades of economic collapse. But Greek exit from the euro would cause staggering damage to the rest of Europe and its banking system — far, far more damage than they’d suffer from merely increasing their bailout of Greece. See Wolf’s column for more on this. It must be avoided at all costs. Thus, the only option left is for Europe to prop up Greece for years. For all practical purposes, this doesn’t mean loaning Greece money, it means giving Greece money. Lots of it. Europe has not yet truly faced up to the fact that #5 is really their only option. It’s infuriating, the public hates it, and Europe’s political leaders want no part of it. But as Wolf says, “The eurozone then cannot stay where it is, cannot undo what it has done and finds it traumatic to go forward. But the very notion of exit is destabilising. They made it; and they must now make it work.” Like Wolf, I don’t think they have any choice. The only question is how far past the 11th hour they’ll go before finally accepting this.